In DAP, you can not only send automated pre-scheduled emails to your members (Autoresponders), but you can also set up similar pre-scheduled “Reminder” emails to be sent to you (the admin) every time a member reaches a day milestone. Eg: Let’s say you (the admin) want DAP to send you or someone on your team a reminder email to follow up with each member by email once they reach day #7 – meaning, it’s been 7 days since they signed up for a specific product. Further below on that page, in the “Send to 3rd Party (instead of member)” field, select “Yes (like admin or staff)” and you will see an additional text box show up below, where you can enter your (or your staff’s) email id where you want the reminder to be sent. Go to the DAP Product where you want this email to be added to the sequence. 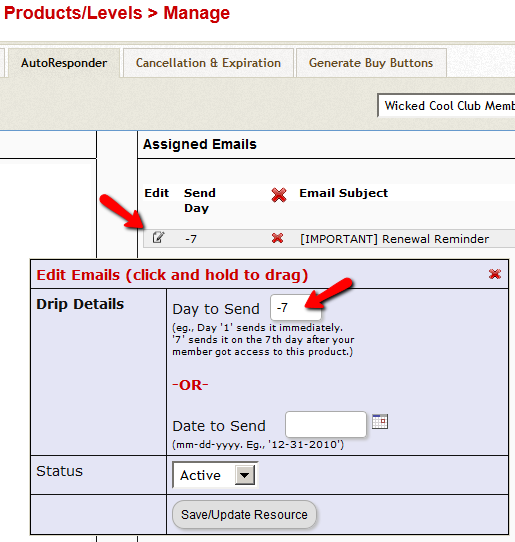 Add this new email to the product, click on the “Edit” icon, and set it to be dripped on Day #7. Now for each member that signs up for that product, regardless of when they join, every time they reach day #7, the reminder email will be sent to the 3rd party email id specified for that message (instead of being sent to member). This is where you can drip emails “X” days (where “X” is a number of your choice) before the access to a product ends for a member. So this is what you would use to send expiration notification / renewal reminder emails to your members. To setup a renewal reminder email, you would set up the email as usual, and drip it as a negative day. So if you set up the email to drip on Day “-1”, then it means the email will be sent out 1 day prior to product expiry (for that product). If you set it up to drip on “-3”, it will be sent out 3 days prior to access end date. If you set it up to drip on “-7”, it will be sent out 1 week prior to access end date. Warning: This is something you should set up only for recurring products that require manual renewal. Do not set up these emails to go out for automated subscription products, because the members will be charged automatically on the designated day every month, and asking them to renew will only confuse them. Create a new Autoresponder email with the product expiration notice, at Email > Autoresponders. In this email, you would say something like “Hey, your subscription is expiring in 1 week, so click on this link to renew… (followed by link to renewal page)”. Create another email that says “Hey, your subscription is expiring tomorrow…”. Go to Products > Manage and choose product for which you wish to set up renewal reminder. Select the 7-day renewal reminder email from step 1 and add it to the product. Do the same for the 1-day reminder email as well, and this time set the dripping to be “-1”. DAP’s Amazon SES integration has been heavily tested, and we use it ourselves at DigitalAccessPass.com . So you can rest assured that there are no “bugs” of any kind. Here are some troubleshooting steps if SES integration is not working even after you’ve followed the documentation exactly. MOST COMMON MISTAKE: Have you whitelisted the DAP “From” email in Amazon? And have you used exact same “case” for the email id in both places (DAP and Amazon)? Double-check spelling and case in both DAP and Amazon – they must be EXACTLY the same. For eg., you@yoursite.com is NOT the same as You@YourSite.com as far as Amazon is concerned. So if you’ve set the “From Email” in DAP to be you@yoursite.com, then you must whitelist exactly the same email id you@yoursite.com within your Amazon SES account as well. If you are not sure, delete the whitelisted email in your SES account, then COPY the from-email from DAP config (be sure to copy, and not re-type) and then PASTE the exact from-email into your Amazon SES account and whitelist it again. IMPORTANT: Have you requested Amazon for “Production Access” to your SES account? Being in “Sandbox” mode has its disadvantages (you can only send “from” and “to” whitelisted” emails ONLY). So your account MUST, MUST, MUST be in “Production” mode before Amazon SES lets you send emails to your customers. Are you using the exact ports as mentioned in our documentation? Ignore the port #s that Amazon recommends. Turn on the logs by setting DAP > Setup > Config > Log Level to “Log All Activity”. Then go to System > Logs and clear the logs. Then go to one of your test accounts, and edit the user. On the “User Edit” page, click on “Resend Login/Password”. Check the email inbox to see if you got the email. If you didn’t, go to System > Logs and take the entire logs shown there, and paste it into a support ticket, and don’t forget to give us your WP login info and FTP info (and if possible, Amazon login info as well), and we’ll troubleshoot it. This could be happening because…. a) Some robot software somewhere is auto-posting to that URL. b) It’s possible that a search engine spider or spambot is hopping from link to link, submitting the form repeatedly from the backend, and because the form is being submitted in an illegal/invalid fashion, DAP is complaining about a missing coupon code. So for now, if everything else is working ok, and the annoying email is the the only issue, then you can just ignore those emails. Or better yet, simply put a filter on that email subject and have it directly sent to the trash folder in your email client. Here are the merge-tags that you can use in outgoing autoresponder and broadcast emails sent through DAP. This will be replaced by the password of the user. This will be replaced by whatever text you have entered in “Setup > Config > Basic > Site Name” in your DAP Dashboard. This will be replaced by whatever text you have entered in “Setup > Config > Basic > Admin Name” in your DAP Dashboard. This will be replaced by whatever text you have entered in “Setup > Config > Basic > Admin Email” in your DAP Dashboard. This is replaced by a 1-click Unsubscribe link that you can add to the bottom of your outgoing broadcast and autoresponder emails. Add ‘custom_’ in front of the custom field’s database field name. So if you have defined a custom field called tax_id in your database, to include this field in the autoresponder/broadcast email, just add this – %%custom_tax_id%% to the body of your email. That’s it. When the user receives the email, dap will automatically replace the merge tag with the user’s tax id value.